September 2018 Free Chip Coupons, Free Spins Codes, and Private Freeroll Passwords for Grande Vegas Casino! Make September your lucky month and finish summer with a bang at Grande Vegas Casino with free chips, free spins, and freerolls! September 2018 depositors at Grande Vegas can claim lots of free spins and free chips with the no deposit bonus codes listed below and new free no deposit bonus coupons will be added to the list as they are released. Please share your own Grande Vegas Casino codes in the comment section below. Good luck! 50 Free Spins for New Players: Register a new account after clicking the banner below and claim noluckneeded.com's exclusive 50 free spins no deposit bonus by redeeming the coupon code "NLN50FREE" in the casino cashier after registration. Free Spins Game: The Big Bopper Denomination: 30 cents; Maximum cashout: $180; Playthrough 60x; $10 max bet; Valid for new players who register from NoLuckNeeded.com. Game: Lucha Libre 2; This bonus is only valid for customers with a valid deposit within the last 30 days (today included). Do not claim two free bonuses in a row. $10 max bet; General Grande Vegas Terms & Conditions apply. $180 max cashout; 60x wagering on slots. Expires 30 September 2018. This bonus is only valid for customers with a valid deposit within the last 30 days (today included). Do not claim two free bonuses in a row. $10 max bet; General Grande Vegas Terms & Conditions apply. $250 max cashout 60x wagering on slots. Expires 15 September 2018. Name: NLN1809GV; Password:OASIS; Start Date: 1 September 2018; Duration: 30 Days; Game: Enchanted Garden; Buy-In: Free, for that you get 5 minutes play time and 5000 chips; Add-Ons: 100 possible, cost $2 + 20 Cent Rake, you get 2 minutes and 2,000 Chips; Prizes may have maximum cashout rules. This bonus can only be requested after one successful deposit in September 2018 has been completed. $10 max bet; Expires 30 September 2018. General Grande Vegas Terms & Conditions apply. $180 max cashout 60x wagering on slots. Anniversary free chips are sent to depositors each year and can range from $10-$250. $10 max bet; Do not use two free codes in a row. General Grande Vegas Terms & Conditions apply. max cashout varies; 60x wagering on slots. Claim your Free Spins & Free Chips this September at Grande Vegas Casino! Grande Vegas Online Casino was established in 2009 as a Real Time Gaming software casino. GrandeVegas is a noluckneeded.com certified and recommended casino due to their long history of reliable payments and good customer service. I just received a new snail mail letter from Grande Vegas! General Grande Vegas Terms & Conditions apply. NO max cashout; 40x wagering on slots. Expires 30 September 2018. Mzmelabella, Thanks! but we do not post exclusives that are not our own. I know some sites do that but I prefer not to if I know it's an exclusive code. I hope you don't mind that I remove the code. This bonus is only valid for customers with a valid deposit within the last 30 days (today included). Go to the cashier's 'Redeem Coupon' section and enter the coupon code STARDUST-SPINS and enjoy 50 Bonus Spins! General Terms & Conditions apply. This bonus is valid until September 30th. shirlsplay, Awesome! Thanks so much for the code! No max cashout! Go to the cashier's 'Redeem Coupon' section and enter the coupon code SCUBA-TOP before you make a deposit! General Terms & Conditions apply. This bonus is valid until September 30th. Playthrough of your free spins is 25 times only. Claim Your Free Spins and play the Scuba Fishing Slot at Grande Vegas Casino! 25 free spins for "Lucha Libre 2"
General Terms & Conditions apply. The maximum payout is $180. This bonus is only valid for customers with a deposit in the last 30 days. This bonus is valid until September 20th. Mzmelabella, Thanks for letting me know! Here's the new code. Go to the cashier's 'Redeem Coupon' section and enter the coupon code TH-89-SPINS for your free spins! General Terms & Conditions apply. The maximum payout is $180. This bonus is only valid for customers with a deposit in the last 30 days. This bonus is valid until September 27th. 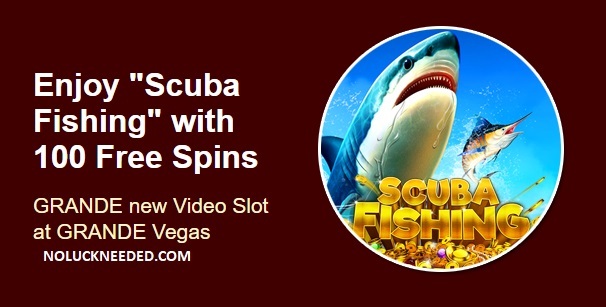 25 Free Spins on SCUBA FISHING for Recent Depositors! NOTE- Valid for depositors in the last 30 days. $180 Maximum cashout rule; 60x wagering.